Van has written two books and says he is personally excited about having more ideas in his head. He always said if he ever wrote a book it was going to be with bigger print than most, and with both, he made good on his promise. 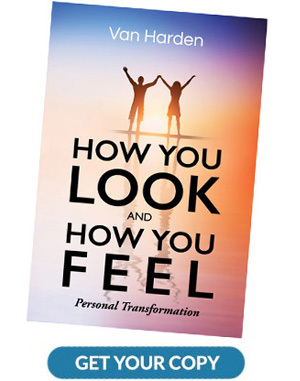 Van's latest book was written after he lost over 100 pounds and was bombarded with the question, "How did you do it!?!?" How You Look and How You Feel explains the entire amazing ordeal and goes through, step by step, where he was, what happened, where he is now and where he's headed. It's helpful if you're wanting to make a personal, physical transformation or maybe just drop a few pounds. Not only that, it is fun, funny, touching and intensely serious... all wrapped up in one! The book is available through Amazon and Barnes & Noble. You can listen to the first chapter below. Van's first book was released in 2013 and was an immediate hit. It's a book about living in two separate worlds at the same time, which is a concept that may not sound plausible, but through his easy to read and understand, conversational writing style and illustrations, you will totally get it. It's "evergreen," so it will be just as pertinent 100 years from now as it is today. This book is for anyone and everyone, whether you're in a time of joy, defeat or emptiness. It is just as relevant to the President of the United States as it is a homeless person living under a bridge, or all of us somewhere in between. Everyone will find themselves on his map, but it's especially good for those going through tough times. 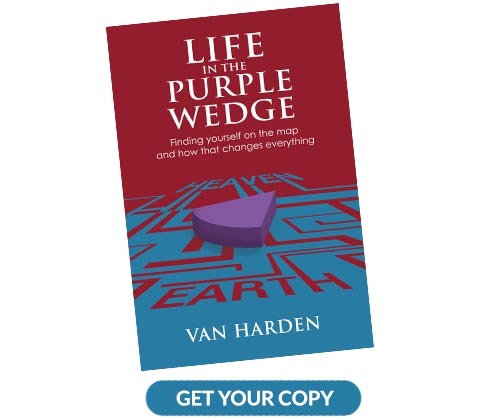 Life in the Purple Wedge offers a clear guidance and tremendous perspective as to where you actually are right now in your life. There’s nothing more grounding and assuring than knowing where you are, from where you’ve come and where you are going. From this amazing “big picture” angle, you’ll find that your life and daily routine look entirely different. Letters Van has received from readers have brought him to tears as they tell him of how their eyes were opened to the huge picture of their life, especially living in the purple wedge. The book is available through Amazon and Barnes & Noble. You can listen to the first chapter below. "I read the whole "Purple Wedge" book before I went to bed." "I read the whole "Purple Wedge" book before I went to bed....fascinating...so interesting that Van has been an Adult Bible teacher for 30 years...I'm SURE you DO gain lots of insights doing that...which Van surely has. I'd like to get more for me to give as gifts to my Church Small Group...I'm sure they would find it interesting, also." "Just as Christianity is simple and complex in it’s variations…so is Van’s little book!" "When I first looked over the book; I noticed the large print, thinking this will be a quick easy read. Because I enjoy reading old reformed books, I arrogantly thought that this would be a pretty simplistic look at Christianity. Well it is, and it isn’t. The red circle, with points of life and death on either side is simple enough, then add that blue eternal rectangle over the part of the circle representing the point of salvation and you have a mental, visual example of life in the purple. Again, simple enough, but it has really stuck with me. When I’m frustrated, or down right angry about the politics of the world, or the family problems and even simple traffic problems, my narrow world becomes an awful place to be, until I recognize that indeed “all things work for the good of those who love the Lord”, and despite my initial reaction to life’s disappointments, I generally come to the conclusion that whatever happened, happened just as it should, for God’s purpose. Van’s purple wedge has been an even better reminder that Christians are in the world and in the kingdom of heaven. Christ is here, with us, knowing all our joys and sorrows, as well as in heaven. WHAT A THOUGHT! To live in that purple wedge should be easy as pie… not so because that human sin nature continues to warp our thoughts and actions, but this little gift gives me yet another tool to help me remember that I am a member of the Kingdom of Christ and nothing can take that away from me. Just as Christianity is simple and complex in it’s variations…so is Van’s little book!" "I read the entire book last night and loved it!" "I read the entire book last night and loved it! I have always known that I am heading for Heaven for eternity, but I have never heard it explained exactly like you have done in your book. Isn’t it amazing that when you start out that red circle seems so big, but as you read through the book, that red circle seems to get smaller and smaller. If you believe in God, you put that red circle in perspective with eternity. I’m not a great reader and I have trouble staying with a book, but once I started The Purple Wedge, I didn’t want to stop. My wife could not believe I had read the entire book and so she is reading it this morning. You’ve done such a good job in writing this book. Thinking about what you wrote is one thing, actually sitting down and writing is an entirely different experience and you have done it well. My sense is that a lot of people will be touched by your book and I am one of them." "Boy is that a great book." "Wow! Boy, is that a great book. I will certainly recommend this to our Pastor and I will be sending a copy to each of my children and brothers as well. He presents it with such clarity and simplicity, yet with a depth of understanding that others can not articulate. 'In this world, but not of this world.' Thanks for placing that in my path and God bless you." "I have loved your book so much." "I have loved your book so much that I took my Mom a copy. She read it Friday night and wants to purchase 3 copies of your book for her small group. We are going to purchase 3 for our Hope small group." "As popular as the Purpose Driven Life." "I really think this book Life in the Purple Wedge will be received as popular as the Purpose Driven Life in it's universal appeal." "I never thought of my walk with Christ in the way you lay it out." "My wife gave this to me as a gift. It is short, simple to read and the print is large, but the great thing is the message. I never thought of my walk with Christ in the way you lay it out, but the diagram is right on track. In the past I was living for 'me,' not 'He,' as you say." This is a Harden book alright, but not Van… Drew Harden. Drew is my son. We both graduated from college a semester early because we knew what we wanted to do in life and wanted to get started as soon as possible (the difference was he had a double major)! Drew has always been bright and extremely creative. In fact, as a kid, he had not one, but five imaginary friends. He co-founded Blue Compass, a booming company in West Des Moines that is helping businesses large and small with their websites and digital marketing. 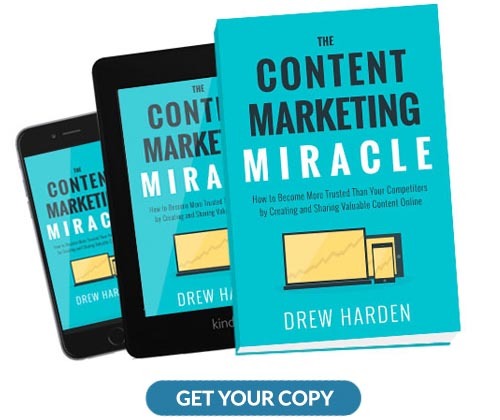 This could be a very important book for you if you’re looking for growth in blogging, search engine optimization, and digital marketing. He covers key issues with a very down to earth and easy to understand communication style. I would highly recommend this book even if he wasn’t my son. It has helped me. And Blue Compass helped me put together this website!